(NEW YORK, NY—February 9, 2017)—Opening on February 10, 2017, on the occasion of the eightieth anniversary of the Solomon R. Guggenheim Foundation, Visionaries: Creating a Modern Guggenheim features more than 170 modern objects from the permanent collections of the Solomon R. Guggenheim Museum, New York, and the Peggy Guggenheim Collection, Venice. Assembling many of the foundation’s most iconic works along with treasures by artists less familiar, this celebratory exhibition explores avant-garde innovations of the late nineteenth through mid-twentieth centuries, as well as the groundbreaking activities of six pioneering arts patrons who brought to light some of the most significant artists of their day and established the Guggenheim Foundation’s identity as a forward-looking institution. Visionaries includes important works by artists such as Alexander Calder, Paul Cézanne, Marc Chagall, Vasily Kandinsky, Paul Klee, Fernand Léger, Piet Mondrian, Pablo Picasso, Jackson Pollock, and Vincent van Gogh. Visionaries: Creating a Modern Guggenheim is organized by Megan Fontanella, Curator, Collections and Provenance, Solomon R. Guggenheim Museum, with support from Ylinka Barotto, Curatorial Assistant, Solomon R. Guggenheim Museum. Installed in the Frank Lloyd Wright–designed rotunda and the Thannhauser Gallery on Tower Level 2, this exhibition showcases the museum’s exceptional modern holdings as organized through the perspectives of six proponents of the avant-garde who intersected with the Guggenheim Foundation in the early decades of its history and gave their personal collections, in whole or in part, to the institution. 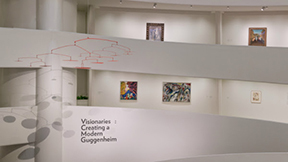 Of these visionaries, foremost is the museum’s founder, Solomon R. Guggenheim, who, with support from his trusted advisor, the German-born artist Hilla Rebay, set aside a more traditional collecting focus to become a great champion of nonobjective art—a strand of abstraction with spiritual aims, epitomized by the work of Vasily Kandinsky. Amassed against the backdrop of economic crisis and war in the 1930s and 1940s, Guggenheim’s unparalleled modern holdings formed the basis of his foundation, established eighty years ago in 1937 with the goal of encouraging art, art education, and enlightenment for the public. Visionaries offers a rare opportunity to explore in-depth key artists represented among the museum’s holdings, such as Kandinsky and Klee, through multiple examples that reflect the shared interest in their work among the six featured patrons. The exhibition includes nearly twenty-five works from the Peggy Guggenheim Collection, seldom displayed outside of the Venice palazzo, including canvases by Max Ernst, René Magritte, and Yves Tanguy, and sculptures by Joseph Cornell and Alberto Giacometti. Among this group, Jackson Pollock’s Alchemy (1947), considered among his finest paintings and a celebrated icon of postwar abstraction, will be shown in the United States for the first time in almost fifty years. More than a dozen works on paper by Picasso and Van Gogh, rarely on view to the public, will be installed in the Thannhauser Gallery, where the earliest works represented in the Guggenheim collection are typically on display. Additionally, sculptures by Edgar Degas and paintings by Pierre-Auguste Renoir, Paul Gauguin, and Édouard Manet will be placed on the ramps for the occasion of the exhibition. In May, a fresh selection of works on paper by artists including Klee, Picasso, and Van Gogh will replace the first grouping. Several conservation projects have been initiated as part of the planning of this anniversary exhibition. Red Lily Pads (1956), a painted steel sculpture by Alexander Calder spanning nearly 17 feet that will be suspended over the rotunda’s fountain, underwent extensive historical research and analysis, resulting in a beautifully integrated surface and restoration of the mobile’s proper balance. Manet’s Woman in Evening Dress (1877–80) was studied by a group of curators, conservators, and scientists who traced the history of the work and examined discolored resin varnish and overpaint on the surface. A complex treatment removed this coating to reveal a cool palette, vigorous brushwork, and the fine details of Manet’s sketchy composition. Luciano Pensabene Buemi, Conservator of the Peggy Guggenheim Collection, cleaned The Studio (L’Atelier), 1928, an oil and crayon on canvas by Picasso, before the work traveled to New York. Additionally, works by Josef Albers, Kandinsky, and Mondrian, among others, were treated in preparation for the exhibition. In addition, Exploring “Alchemy”: Jackson Pollock will be on view in the Guggenheim’s Sackler Center for Arts Education concurrently with Visionaries. Organized by Carol Stringari, Deputy Director and Chief Conservator, Solomon R. Guggenheim Foundation, and Susan Davidson, Senior Curator, Collections and Exhibitions, Solomon R. Guggenheim Museum, in collaboration with the Peggy Guggenheim Collection, Venice, and the Opificio delle Pietre Dure, Florence, this didactic exhibition presents an in-depth investigation of Pollock’s materials and working process. Visitors will enter the world of the scientist and the conservator to follow the investigative process and the treatment of the complex surface of Alchemy. A rich digital archive of enhanced collection information and materials including biographies of each of the six featured collectors, historical photographs, and videos will be available online during the exhibition at guggenheim.org/visionaries. Also accompanying Visionaries is a fully illustrated catalogue containing a lead essay by Megan Fontanella on the intersections and collection strategies of the six museum patrons. Focused essays by other Guggenheim curators illuminate key works in the foundation collection. Educational activities include tours, music and film programs, and a curriculum guide for school teachers.